Fresh coriander is hard to come by during summer and when available, its exorbitantly priced. My vegetable vendor who supplies fresh vegetables, grown in his small farm, brought 2 bunches of fresh coriander. 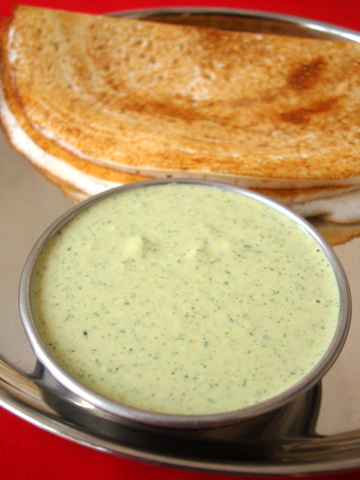 Delighted, I put my favorite herb to use by way of an easy breezy chutney to go with our morning breakfast, Dosa. Makes for a wonderful side with tiffins like dosas and idlis. 1 Heat oil in a vessel, add green chillis and saute for a mt. Remove from vessel and keep aside. In the same vessel add the coriander leaves and saute for 3-4 mts. Remove from heat and cool. 2 Grind the roasted chana dal, coriander leaves, green chillis, coconut and salt to a paste, adding little water. Remove onto a serving bowl and serve with tiffins like Dosa or Idli. Yumm!! I will definitely try next time. WOW..the look of that made me hungry…simple yet satisfying meal…delicious! Your dosa looks perfect and crisp. I use traditional iron tawa, Sarita. Also use non-stick once in a while. Both yield good results. Have been haunting your site lately. Thanks for the wonderful recipes. Have never sauted coriander for a chutney before. Again, am looking forward to trying out all your recipes. I always make this chutney and my son is a huge fan of this!! sailu garu can u plz post fish fry (boneless), may be it tastes like egg fry.. This Chutney is very simple to make, and there is no seasoning required. Great recipe and idea. I must try this! Can I substitute anything else for the coconut in this chutney ? Omit it if you do not have coconut on hand. There is no substitute for coconut but you could roast a few sesame seeds OR use melon seeds (need not be roasted). I tried it and found it to be great! thank you!